The Montana Sub is my Hometown hero, but then again, it was the only hero in town, until the Eastern Idaho Railroad took over the Yellowstone lines. [See the authors' previous article on the EIRR here -- ABC]. That said the Montana sub, in some ways, was and is like the Delaware and Hudson, in that it is a bridge line. For me it's like the "ghosts of futures past". I played literally in it's shadow as a child. There is a culvert in the middle of the fill that starts at the end of my street. Crow creek that runs under the culvert is piped till one block before it. I played, dammed, and bridged that creek all the while trains ran by. The culvert is over 100 years old now. From it's beginnings it was a cash cow for UP. It was a narrow gauge line, standard gauge line, bridge line, drag line, and the Yellowstone line. Local power then was old GP-9's and GP-9B's. When I was very small, there was a SW switcher that worked the old Eagle Rock line. Main power was SD 40-2's and any other power that got stuck on. Many times 8 to 12 locos would pull a train that was about 5 miles long. I spent many nights at 3 o'clock in the morning, watching cars from all over North America go by. You could see cars from big lines to short lines. Well into the 80's I could still see pre BN line cars in their old paint. It was a time machine that also took me all over the country. Remember at that time traffic was on it's way down, much like a hollow shell of it's former self. Flash to today, traffic is way up. Where one railroad was, now there is two. Big power comes to town in the form of AC's, and locomotives from distant railroads hide out from the paint shop or the scrap heap. This is what Uncle Pete calls John Wayne country, literally on it's signs. Where in the USA can you watch three AC's pull a long string of covered hoppers, plummet through a cloud of steam from a potato processing plant, obscuring the track, going 45 miles a hour... then scream through a curve in a shower of sparks, and then vanish like a ghost? Ah, the wild west, the stuff of legends. Utah, Idaho, and Montana have plenty of these legends of people, places, and railroads. Now, you ask yourself, what does this have to do with Union Pacific's Montana Subdivision? It began when the transcontinental railroad linked up at Promontory Point, on May 10, 1869. In Utah, there was a strong disdain for anybody who was not a member of the Mormon faith. Now the leader of the church was Brigham Young, and up in the northern part of Utah there was a place called Correne. Correne could be nicely described as a rough town; to LDS church it was the gates of hell. If it had only one redeeming quality, it was that it was the closest railhead to Montana. Largely a collection of warehouses for teamsters, Correne was getting rich on it's freight route to Montana's mining towns. All this prompted Young to organize a narrow gauge railroad to Montana's mining towns, to be called the Utah Northern. But, as we all know, railroads need capital, and the most northern the UN got before going bust was the Mormon enclave of Franklin, which is just barely inside of Idaho. Enter Jay Gould, one of the famous rail barons who controlled Union Pacific. UP promptly took control of the UN reorganizing it under a new name Utah & Northern. With Gould's wallet the U&N promptly spread its tentacles towards Montana. In October 1881 they reached Silver Bow, Montana, then Butte, Montana. In the late 1800's, Butte went from a precious metals camp to the copper mining center of the world. It was the largest city between San Francisco and Denver, the realm of copper titans James Clark (later to be a US Senator,) and Marcus Daily. The Utah & Northern became one of the most far-flung narrow gauge empires in the west. In 1884, the Oregon Short Line was completed, connecting the UP main line, at Granger, Wyoming, to the Pacific Northwest via the Oregon-Washington Railroad and Navigation Company, giving UP an outlet to the Pacific not reliant on the Central Pacific. The OSL also connected with the narrow gauge U&N at Pocatello. With the rise of electricity, which copper is an important component of, traffic to and from Butte rose to the breaking point on the narrow gauge railroad. On July 24, 1887, the U&N was standard gauged, all in one day. For years, the traffic remained a bonanza for the Union Pacific. Consolidation within the Union Pacific Railroad Corporation renamed part of the old U&N into the Montana Subdivision. The Montana Sub starts at Pocatello Junction in Pocatello, and ends at Silver Bow, Montana, just outside of Butte. UP had for years trackage rights into Butte on the Montana Western. At Silver Bow, UP interchanged with the Montana Western, the Northern Pacific, the Milwaukee Road, and the Butte, Anaconda and Pacific. Now, only Rarus Railway remains to interchange with, who then hands off the traffic to the Montana Rail Link. Along with all the local traffic along the way to and from Butte, this line was also a bridge route. In the late 50's and 60's, Butte began to decline, although this line still had a decent amount of local and bridge line traffic. Other Subdivisions that connect with the Montana sub include the Pocatello, Gay, Aberdeen, and Scoville Subdivisions. UP sold the Yellowstone lines to Eastern Idaho Railroad. Pocatello is the major division point, where most trains are made up for the trip north. Idaho Falls, Blackfoot, and Dillon are the service points from which the local crews work. Blackfoot is where the Aberdeen and Scoville subs connect. The Blackfoot's, and its connecting Aberdeen sub's, major traffic is potatoes. The Aberdeen Branch will also see one or two locals a day, depending on the traffic. These trains run later in the day, and bring their cars to Blackfoot to be interchanged with the 47. The Dillon local starts its journey from Dillon on Monday, Wednesday, and Friday, and back to Dillon Tuesday, Thursday, and Saturday. This train leaves Dillon at about one in the afternoon, and about the same time from Idaho Falls. Normally it runs earlier on Saturdays. Bridge traffic is a important part of the Montana sub, with a lot of MRL and BNSF cars going north. 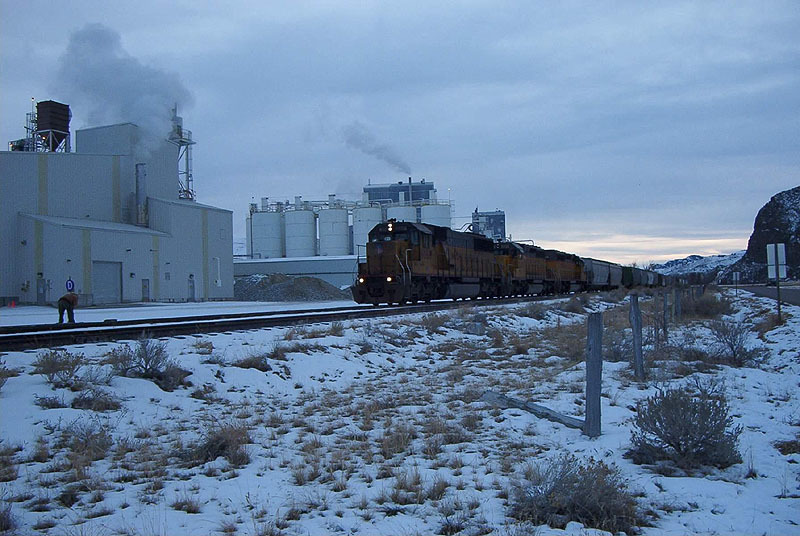 Occasionally, unit grain trains are run from the grain elevators in Blackfoot and Idaho Falls, but you would have to find the right time to catch them. Another train worth mentioning is the American Orient Express. There are two different trains which bring tourists to Yellowstone and Grand Teton National Parks. Recently they were stopping at St. Anthony, on the Eastern Idaho Railroad, but the travel plan for this year will find them at Idaho Falls, where they will be cleaned and readied for when the passengers arrive back from the parks. 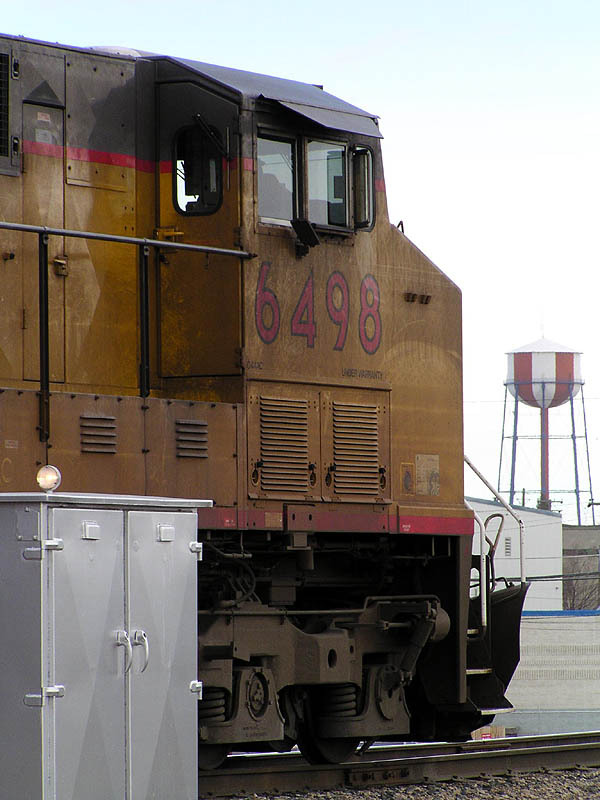 The Idaho Falls yard is the interchange with Eastern Idaho Railroad. UP is partnered with EIRR for potatoes, including UP's Express Lane perishables service. Reefer cars are of UP or SP origin, but UPs new "chilled express" cars are showing up more often. Agricultural related commodities include potatoes, grain, barley, hay, fertilizer, chemicals, and herbicides. Non agriculture related traffic includes scrap metal, talc, lumber, wood chips, propane, aggregates, tar & asphalt. Big power comes to town in the form of C44AC's and SD70MAC's, and locomotives from former SP and Rio Grande heritages are occasional visitors. Regular power from EMD's stable are GP38, GP38-2, GP40, GP40-2, SD40-2, SD40T-2, SD60, and SD70. GE power comes in the form of C30-7, C36-7, C40-8 and C44AC. The MAC's and C44AC usually go no further then Idaho Falls. UP sometimes uses these locos to drop off and pick up from the old station yard, (which replaced the first station in the 60's,) when the Idaho Falls yard is full. At first GP38's or 39's were the conventional power for trains such as the locals, with an occasional SD40-2, SD60, or C40-8 for through freights. With the older locomotives being retired, locomotives like the SD40-2's have taken much of the same duties as the SD70M's and C44CCTE's. The SD40-2's have really made their appearance, as they too run their last miles on the Montana Sub. With heavier trains becoming more commonplace, it comes as no surprise that such large locomotives are showing up. The primary trains that travels the entire route are the symboled trains "PCSB" and the "SBPC". The "PCSB" is the Pocatello-Silver Bow train, and the "SBCB" is the Silver Bowl-Pocatello train. This train leaves Pocatello at about five and Silver Bow at about the same time, sometimes earlier. The morning after leaving Pocatello, the train stops in Dillon that night, and wont leave for Silver Bow until the next morning with a fresh crew. The Southbound train also changes crews in Dillon. The next train is the "47", which stands out amongst the other trains, because it will run during the daytime, whereas the others run primarily during the late evening or night. Leaving at about 11:00am, the 47 takes cars from the locals and the EIRR in Idaho Falls, and the locals in Blackfoot, and moves them to Pocatello, where they are sorted out for further routing. The "48" and the "49" are next on the list. Occasionally the 49 leaves first from Idaho Falls at about ten at night, and runs to Firth and back. This is a true local, as it switches out of the local potato houses and the Anheuser-Busch malting plant south of Idaho Falls. After the "49" gets back to Idaho Falls, the same power is put on the "48" with a fresh crew. The 48 takes loaded reefers from Idaho Falls to Pocatello and comes back with empties early morning. The 47, 48, and the 49 runs one after the other, when one comes back the other is about to leave. The 62, also known as the Dillon Local, has more distance to cover than the other locals. The 62 runs on a tri-weekly basis through lush farmland, sporadic farming, then desert, mountains, and finally ranching country. The most preferred spots to photograph along it is between Dubois and Dillon. Just North of Spencer is the Beaver Canyon, which you may have to hike into, if you want some pictures in the canyon. The authors would suggest getting off the interstate at the next exit after Spencer, and onto the old Butte Highway, where you can cross a large trestle and look down at the tracks across the Canyon, and get some very nice shots. Other locations are up to the photographer. You will need to consult a topographic map to find a road in some of the more impassable regions, but the roads typically stick to the tracks. Don't take them though, they won't give you as much exposure to the tracks as you would want. The preferred road is the old Butte Highway, which stays with the tracks most of the way. It wouldn't hurt to take some time in Beaver Canyon as there is much to see, but at the same time be aware of trains. Steve Spring, Layne Hansen, and Ben Ostensen are all residents of Idaho Falls, along the EIRR and UP Montana Subdivision. Steve is VP of the Eagle Rock Railroad Historical Society, and can be reached at lazarus@ida.net. This is their second joint article for NWOR.